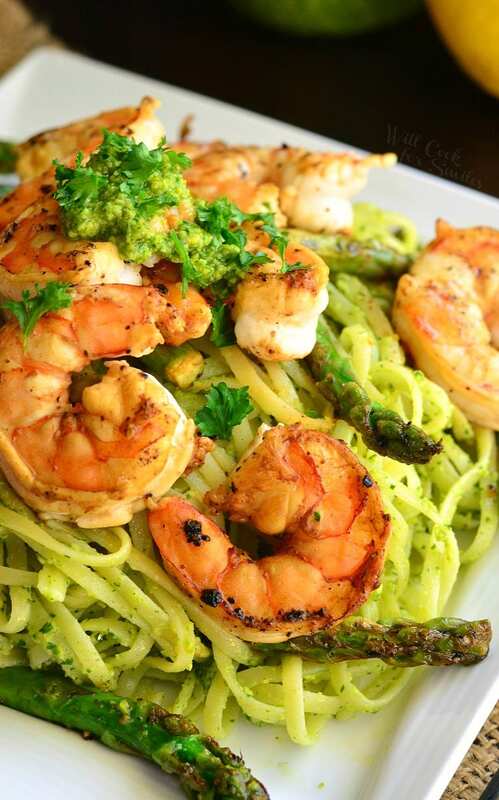 Delicious pesto pasta dish flavored with homemade Lemon Pistachio Pesto and served with sauteed asparagus and shrimp. 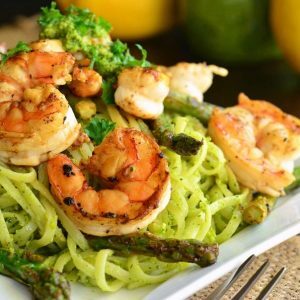 This is a beautiful and simple spring dish that offers a little twist on a traditional pesto coated pasta. I’ve been craving some pasta for months now, so I decided to bite the bullet and try gluten free pasta. Surprisingly, it’s not bad. I’ve been crushed by gluten free versions of foods I used to enjoy in the past. For example, gluten free pizza is just not the same and in no way compares to the real thing. Gluten free pasta, on the other hand, is actually very close to the real pasta. There is no rise required in a pasta, so the texture difference is hardly noticeable, as compared to the bread and pizza difference. It’s nice to know that when I have a pasta craving, I can definitely satisfy it. 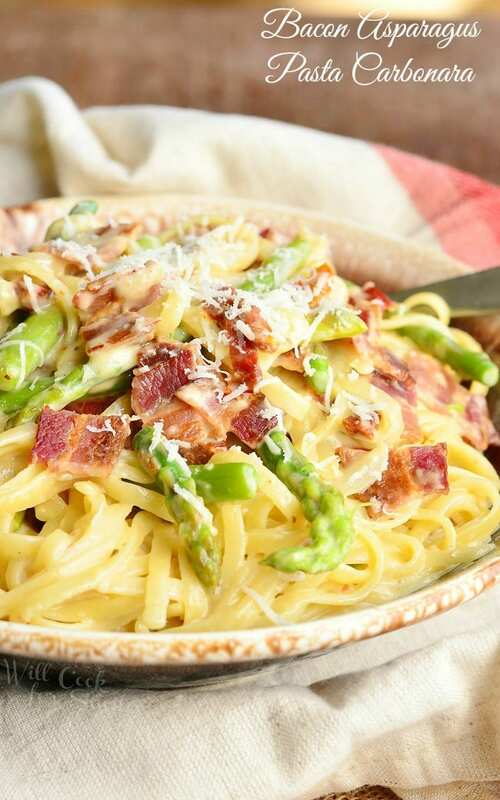 For dinner Friday, I wanted to treat myself to a spring inspired pasta dish and the best way to showcase a spring pasta dish is to keep it light and add spring vegetables. That means no heavy sauces or heavy veggies. Asparagus, peas, and artichokes are some of the best spring veggies to bring the fresh and crispy texture to the dish. 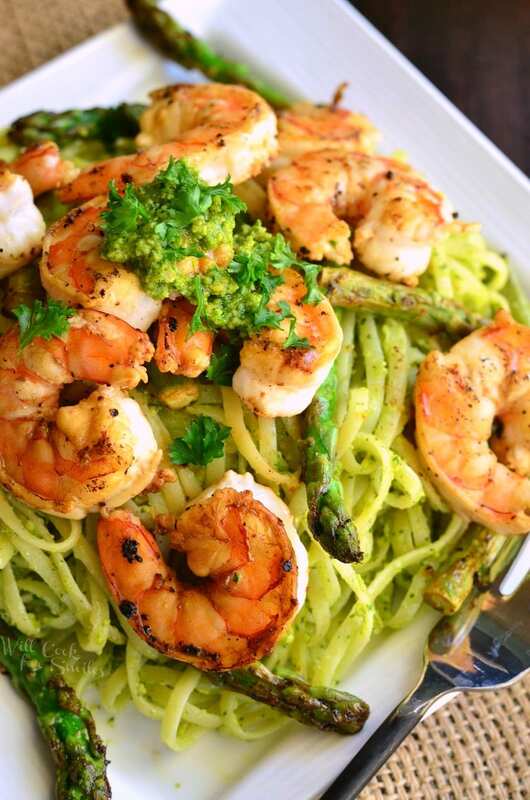 Pesto adds a beautiful flavor to pasta and it’s a great way to substitute a sauce so your pasta isn’t dry. 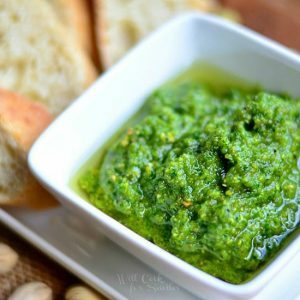 Instead of the classic pesto, I decided to use another favorite pesto of mine. Lemon Pistachio Arugula pesto is something I fell in love with a few years ago, when I tried in at a local restaurant. I love the citrus kick in it from the addition of lemon and the creaminess from pistachio nuts. This pesto is perfect for spring pasta dishes because of it’s fresh lemon kick. 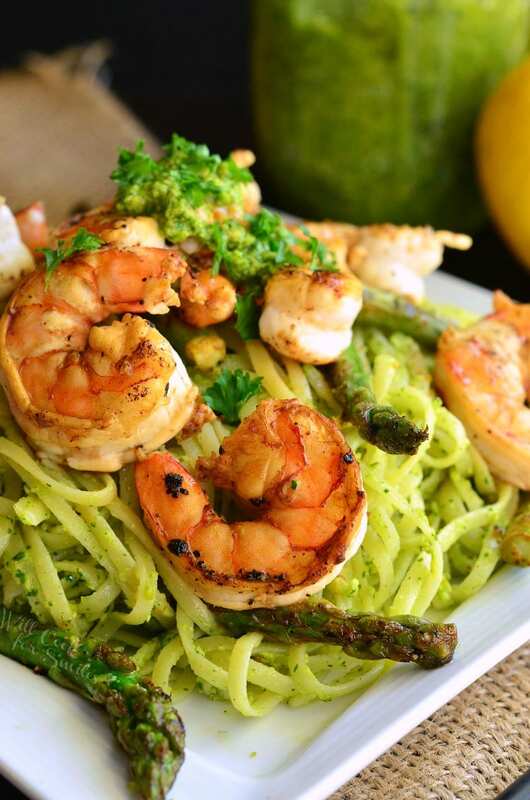 Note: I have a recipe for Lemon Pistachio Arugula Pesto right HERE but if you don’t feel like clicking around, I also added the recipe below the pasta recipe. 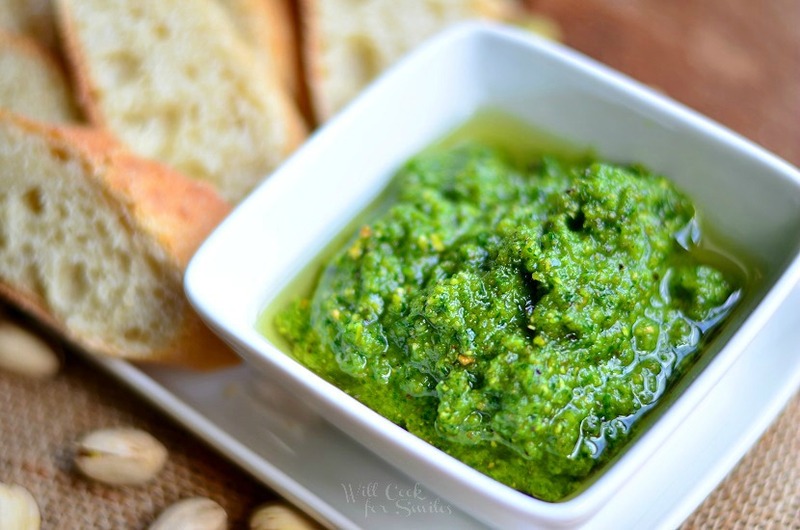 Lemon Pistachio Pesto is DEFINITELY worth a try, not just with pasta but as a bread dip and on sandwiches as well. If you’re not sure about making it only because the thought of shelling a cup of pistachios (that’s a cup shelled pistachios) is scaring you, don’t be scared. They DO sell shelled pistachios at the store! I’ve only seen salted pistachios at the store so make sure not to add any more salt to your pesto until you blend it and try it. 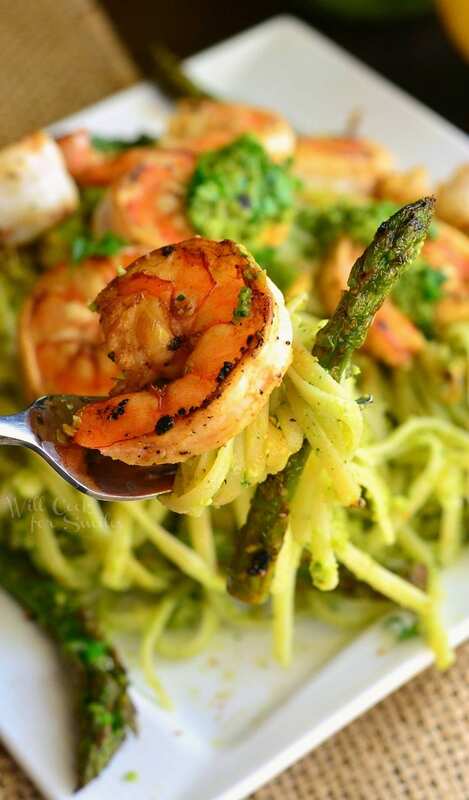 Delicious pesto pasta dish flavored with homemade Lemon Pistachio Pesto and served with sauteed asparagus and shrimp. Cook pasta according to the package directions. Drain and set aside. While pasta is cooking, shell and clean the shrimp. 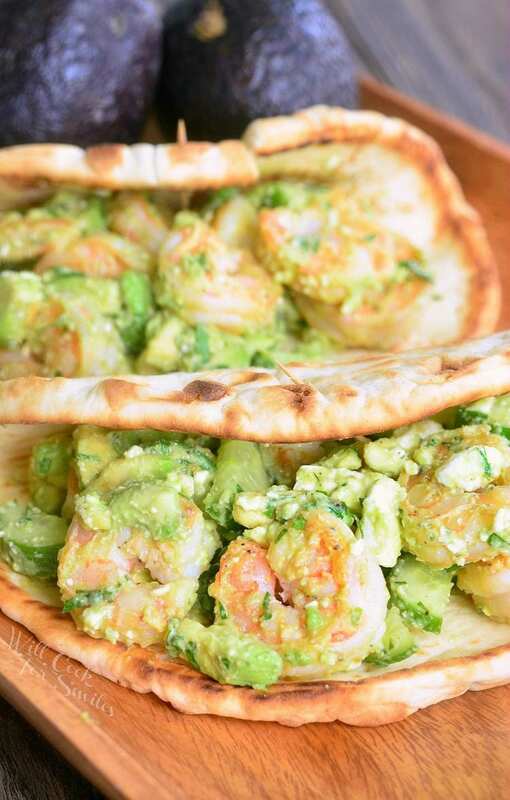 Combine clean shrimp, lemon juice, vinegar, and some salt in a small bowl. Mix well and let it stand for a few minute, until ready to use. 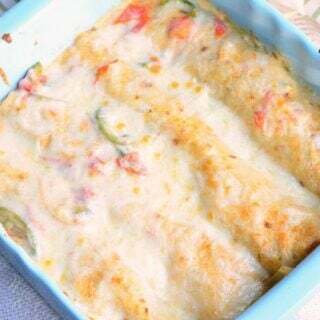 Preheat a medium cooking pan over medium-high heat. 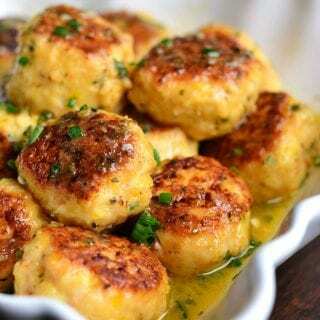 Add a couple of tablespoons of vegetable oil for cooking. Cut the white/purple ends off the asparagus and chop the asparagus stalks into about 2-inch pieces. Add asparagus pieces to the preheated pan and add lemon juice, salt, and garlic powder to asparagus. Stir well and let it cook until asparagus starts to soften. 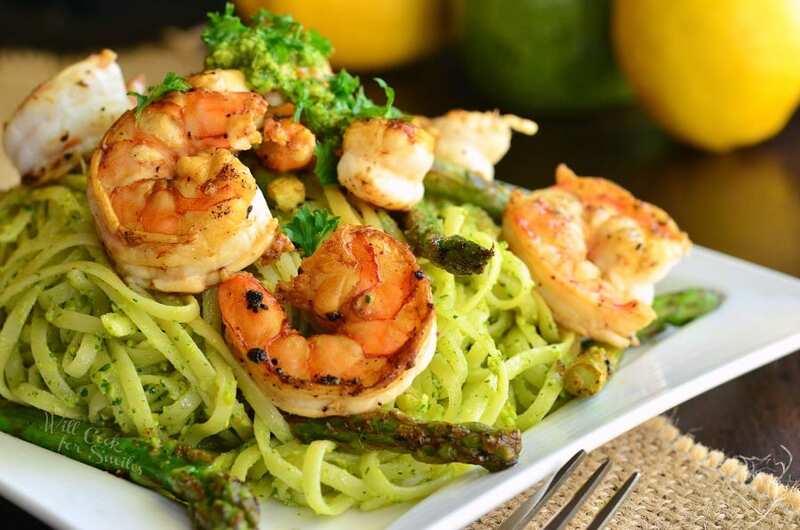 Discard the liquid from shrimp and add shrimp to asparagus. Cook just until shrimp turns opaque on one side and flip them. Once shrimp turns opaque on the other side, take it out of the pan. Mix cooked pasta with pesto very well. 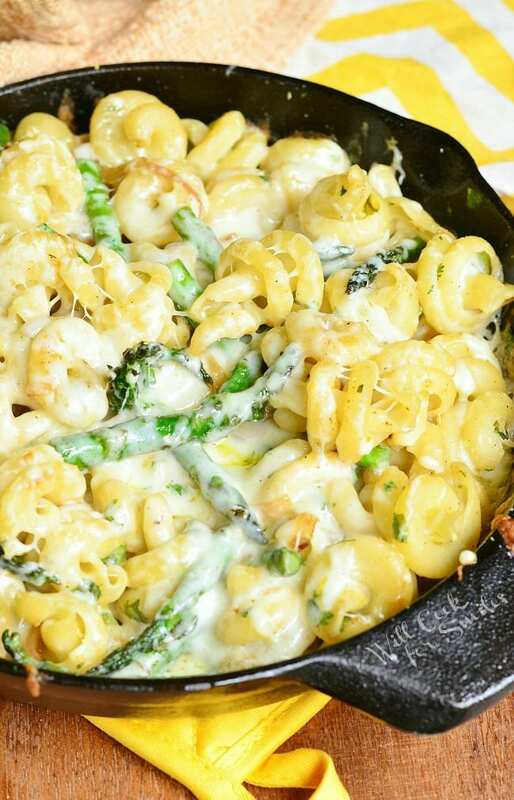 Plate your pasta and top it off with shrimp and asparagus. 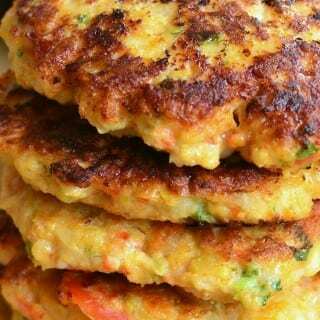 Combine your dry ingredients in a food processor and pulse until coarsely chopped. 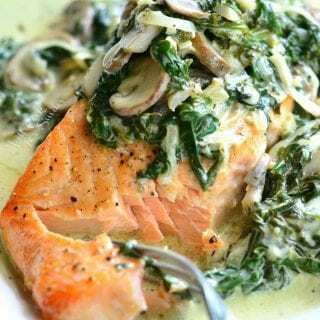 Add oil and lemon juice and blend until completely mixed and smooth. Taste to see if you need more salt. Add more oil if desirable. Keep refrigerated, in an air-tight container. NOTE: if using salted pistachios, don't add any more salt until you blend the pesto and taste it first. 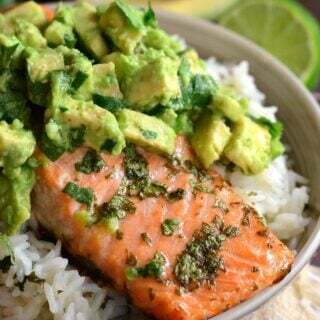 Beautiful dish! Makes me want to dive right in. 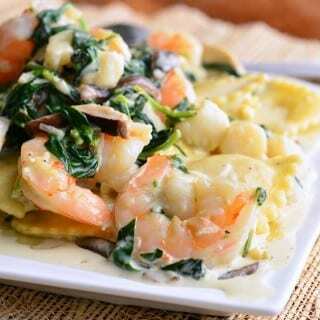 There is something so special of wild-caught shrimp and pasta — a great combination. We could eat it almost every night.